Leukemia is a cancer in which abnormal white blood cells are produced in the bone marrow. These abnormal cells, called leukemia cells are cancerous. In other words, they grow out of control. Eventually they spill out of the bone marrow into the peripheral blood. The leukemia cells are not able to function as immune cells like other white blood cells, and their population keeps growing. Eventually they crowd out normal blood cells, including normal white blood cells, red blood cells, and platelets. 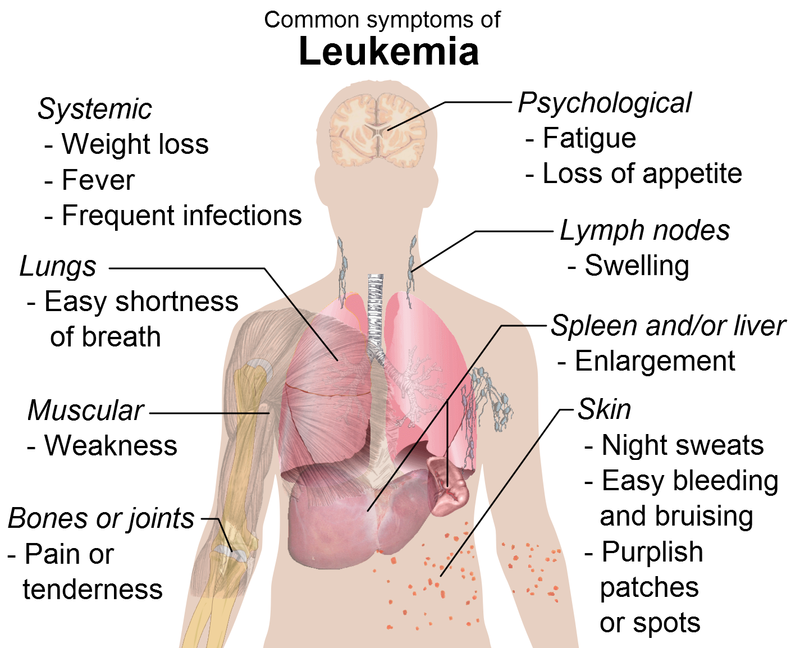 There are so many leukemia cells that the normal blood cells cannot do their jobs of preventing infections, carrying oxygen, and causing the blood to clot. A child who has leukemia is infection-prone, looks pale, and bruises easily. More information on leukemias in general on the NCI web site. Note that you can toggle back and forth between “Health Professional” and “Patient” versions. There are different types of leukemia. These types are broadly classified as acute – gets worse quickly – or chronic – gets worse slowly. They are also grouped by the type of white blood cell that is affected: lymphoid or myeloid cells. Although all types of leukemia can occur in children, the most common types are Acute Lymphoblastic Leukemia, or ALL, and Acute Myeloid Leukemia, or AML. Adult leukemias (CLL, CML) are very rare in children. Two distinct types of myeloid leukemias are seen in children: JMML and APL. If you want to know about a type of leukemia that is not listed above, go to the NCI index page for all leukemias. Treatment for childhood leukemia depends on the type of leukemia and on prognostic factors that have been carefully determined by previous clinical trials. In general, childhood leukemias are treated with multi-agent chemotherapy including treatment of the central nervous system (CNS). Chemotherapy often includes steroids, vincristine, L-asparginase, methotrexate, 6-mercaptopurine, doxorubicin, cytarabine, and cyclophosphamide. Radiation and stem cell transplants are included in the treatment of some types of leukemia, especially in relapsed leukemia. An article by AML expert Dr. Robert Arceci entitled Myeloid Leukemias – Current and Future Approaches to Targeted and Individualized Therapies. Approximately 2,400 children and adolescents younger than 20 years diagnosed with ALL each year in the United States . There is a sharp peak in incidence of ALL and AML for 2-3 year olds. A good source of statistics is SEER fact sheet, which reports in detail the survival rates, incidence, and risk factors for childhood leukemias. JMML Foundation The JMML Foundation was established to provide much needed support and information specifically for families affected by Juvenile Myelomonocytic Leukemia and for those who treat the disease.